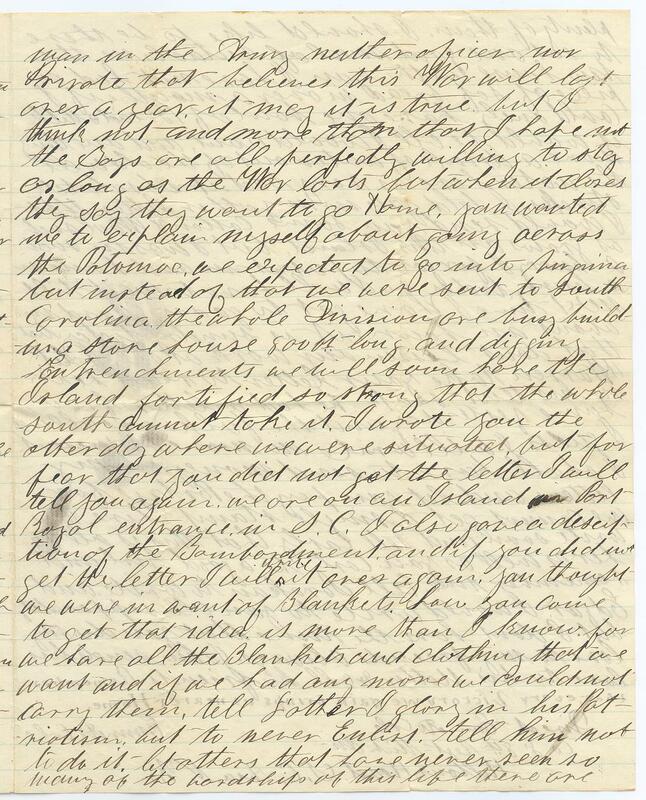 Item description: Letter, 17 November 1861, from Emmett Cole, Company F, 8th Michigan Infantry Regiment, to his sister Celestia. 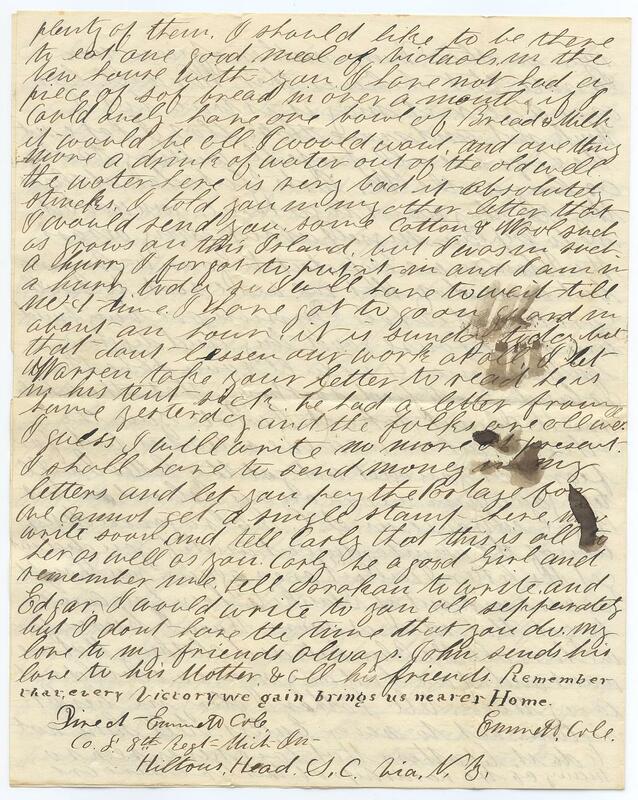 Written from Hilton Head Island, S.C., several days after the Battle of Port Royal. It was but a day or two ago that I sent a letter to you but I must write you another today. in answer to one I received from you yesterday. it came to hand just as I was getting ready for Breakfast. and I was never so glad before in my life as I was when I saw the well known hand writing. it was the first letter I had received from home and you may judge how glad I was. I am well and hearty with the exception of a bad cold it is caused by being on guard and exposed to the night air. John is not very well he has been complaining form several days but he will come out all straight in a few days it is the first time he has been down since he enlisted. Celestia I am sorry you feel so bad because I am absent it reminds me of the words (not many may know the depth of true Sisterly love) Oh! how true and how glad I would be to see you Celestia if I could but I know I cannot just now and so I rest contented I have not been homesick since I enlisted, but if I do feel a little dis___ when I see the Stars & Stripes move slowly up the Flag Staff, at sunrise it nerves me up and I feel all right again and I am not alone. they are not counted by ones nor tens who have left their homes and friends to encounter the hardships and dangers of war for Freedom, but by Thousands and now Celestia I tell you the trust I am not a bit deceived in this affair for I expected to see hardships before I started and you remember that I told you so. you say I have your Prayers where’er I go. I knew I did. I knew it the while, but Celestia pray not for me alone but for the whole Army and Celestia I do not believe that Sister’s and Mothers Prayers, as they ascend to Heaven from our Northern Homes will do more toward ending this deplorable war. than all the iron and steel that we possess. there is a great deal of Immorality in the Army which I am sorry to see and a great deal of suffering which cannot be helped. A man in the Army makes me think of a boy among a drove of a thousand. he is noticed just about as much. you will see me Celestia in less than three years. there is not a man in the Army neither oficer nor Private that believes this War will last over a year. it may it is true but I think not, and more than that I hope not. the Boys are all perfectly willing to stay as long as the War lasts but when it closes they say they want to go Home. you wanted me to explain myself about going across the Potomac. we expected to go into Virginia but instead of that we were sent to South Carolina. the whole Division are busy building a store house 800 ft long and digging Entrenchments we will soon have the Island fortified so strong that the whole south cannot take it. I wrote you the other day where we were situated, but for fear that you did not get the letter I will tell you again. we are on an Island in Port Royal entrance in S.C. I also gave a description of the Bombardment and if you did not get the letter I will write it once again. you thought you were in want in Blankets. how you come to get that idea is more than I know for we have all the Blankets and clothing that we want and if we had nay more we could not carry them. tell Father I glory in his Patriotism, but never to Enlist. tell him not to do it. let others that have never seen so many of the hardships of this life there are plenty of them. I should like to be there to eat one good meal of victuals. in the new house with you. I have not has a piece of of bread in over a month. if I could only have one bowl of Bread and Milk it would be all I would want, and one thing more a drink of water out of the old well the water here is very bad it absolutely stincks. I told you in my other letter that I would send you some cotton & wool such as grows on this Island, but I was in such a hurry I forgot to put it in and I am in a gurry today so I will have to wait till next time. I have got to go on guard in about an hour. it is sunday today but that dont lessen our work at all. I let Warren take your letter to read he is in his tent sick. he had a letter from home yesterday and the folks are all well. I guess I will write no more at presant. 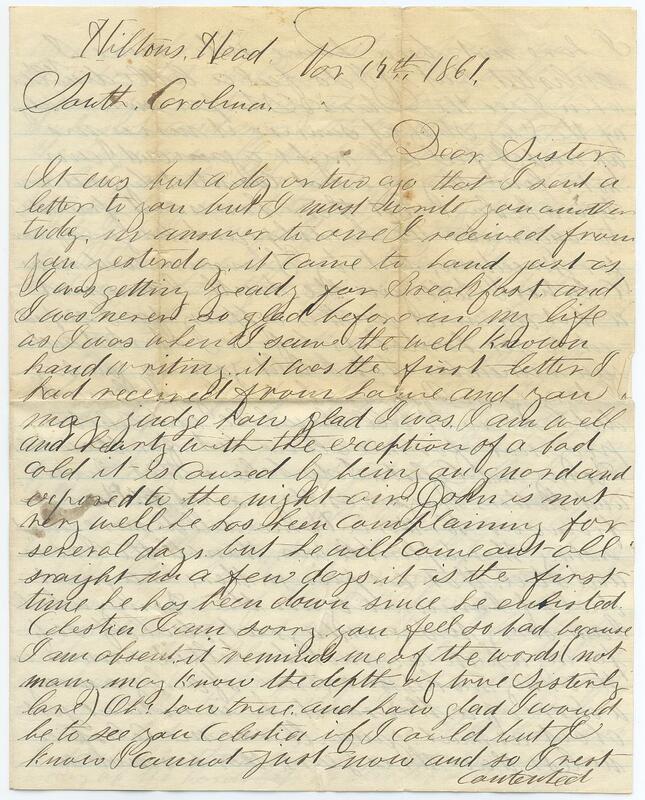 I shall have to send money in my letters and let you pay the postage for we cannot get a single stamp here now write soon and tell Carly that this is all to her as well as you . Carly be a good Girl and remember me. tell Sarah An to write and Edgar I would write to you all sepparately but I dont have the time that you do. my love to my friends always. John sends his love to his Mother & all his friends Remember that every Victory we gain brings us nearer Home. Hilton Head S.C. Via. N.Y. 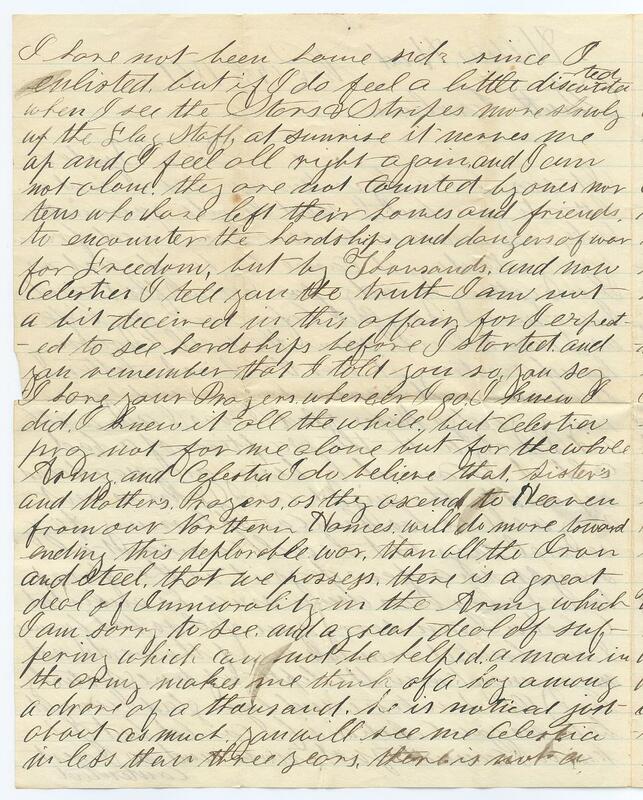 This entry was posted in Southern Historical Collection and tagged 8th Michigan Infantry Regiment, Battle of Port Royal, Emmett Cole, Hilton Head, South Carolina. Bookmark the permalink.